A young adult fantasy romance drama series full of the kind of zombie-filled action that will keep you turning pages and up late at night. Perfect for middle schoolers and young adults who love magic, magicians, wizards, swords and sorcery. The book is full of drama and comedy, and is the prelude to an intense romance in the following books of the series. Bel, a graduate from the Academy of Arts and Magic, takes the final vow of celibacy, sacrificing his love for Shireen in order to be an apprentice. After that traumatic experience, Bel attempts to start his new life under a wise-cracking wizard, but everything is not what it seems. While being chosen as an apprentice is exciting for Bel, he is still hesitant. His new master is one of the most renowned wizards throughout the lands, but his two previous apprentices were killed under his watch. The mysteries surrounding each of their untimely departures from this world has left Bel skittish and insecure. And his mysterious dreams of a one-armed boy fervently warning him about something that he cannot decipher does nothing to calm his fears either. Immediately young Bel and his magician master are thrust into an adventure when reality is torn open allowing the dead to spill out of the underworld. They must journey under the shadow of darkness to try to discover how the fabric of reality has been rent allowing the zombie horde to walk among the living. Who did it and why? Was it intentional? Can they defeat them? Can they close the rift? Can a teenager learning the ways of magic and an ancient sorcerer long past his prime stop the darkness, close the breach and save all reality? When zombie-like creatures start stalking the living, Bel and his magician master are faced with a twofold problem: how do you protect the living by finding the breach in reality, and how do you do find…well…anything when faced with an eternal darkness? With daylight no longer breaking through, they are forced along a dark, treacherous journey that tests the limits of their magic, an adventure leading them into the heart of danger, which may kill them all. And if they fail, all of reality may fall with them. The book is full of swords and sorcery, but magic doesn’t come easy for an apprentice. It requires resourcefulness and sacrifice for the source of all magic is the very light and life of all things. Searching for the source of the tear in reality, magician’s apprentice Bel and the wizard encounter the zombie horde time and time again. These creatures are the living dead and in constant search for human blood. 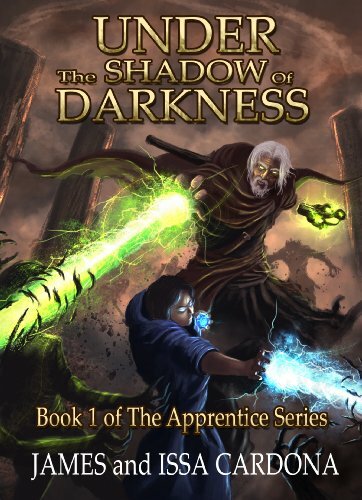 Under the Shadow of Darkness is the sorcerer’s and his apprentice’s adventurous journey to find and attempt to close this breach so that the sun might return again, the dead will remain dead allowing the living to regain their lives once more. Bel’s epic saga is a hero’s journey of a young apprentice who is thrust into a fantastic battle of good and evil, dark and light on his very first day with his magician master. His quest will take them through a dark land filled with zombie like creatures. There’s great detail explaining how magic works and the rules that surround it. It’s hard not to compare teenage fantasy and magic with Harry Potter, but that is where the comparison ends. It’s a different take on magic where a magician doesn’t have to learn how to cast spells properly, but interact with the very forces of life, coaxing them to perform the magic that he or she desires. Jump into this new magical world full of drama, romance, action and adventure.